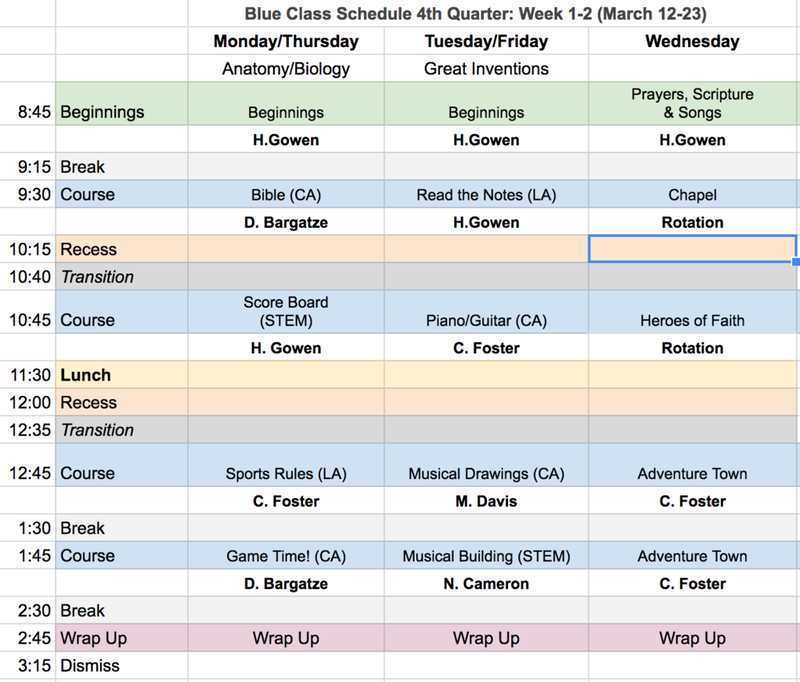 New Quarter, Here we come! This week the students embarked on their fourth and final quarter of the year. With the new quarter came new themes. The themes switched from Textiles and Life/Animal Science to Anatomy/Biology and Great Inventions. Students were very excited about the new themes which only increased when they had each of their new classes. While themes changed, the academic goals continue from last quarter. For example, in 'Read the Notes' class which was 'Plants and Animals Collide' for the final two weeks of the third quarter, students are continuing to learn to take notes from their research. What students are taking notes on has changed but the academic focus remains the same. Please email me if you have any questions about the new themes and classes. Below is the schedule and course descriptions. Bible is a continuation course for the entire school year. This is a description of the course overall as well as the goals from this semester. Description: In this course students continue studying stories and lessons from the book of Exodus. For both semesters (Fall and Spring), we cover major stories from Exodus and focus on life lessons from those stories. Students interact with these stories in a variety of ways including writing, drawing, acting, and telling stories. In the Fall, we went from the Joseph story to the Israelites entering the wilderness. For this Spring Semester, students will continue the Israelite wilderness stories from Exodus 16 to Exodus 34. We cover topics like the Law given in Exodus 20, The Priesthood and their purpose and expected behavior, the story of the golden calf, God’s self revelation in Exodus 34 (specifically on God being gracious, merciful, and slow to anger), and finally the significance of the tabernacle. 1. Students will be able to identify 80% of themes from Exodus. 2. Students will be able to recall the Exodus stories in order from Exodus 1 to Exodus 34. 3. Student will be able to memorize 80% of definitions provided from each story. Description: Score Board is a STEM class with an emphasis in math where students will learn to subtract 2-digit numbers using the standard algorithm with borrowing. They will also learn to solve word problems using subtraction. These word problems will revolve around sports with a scoreboard as the visual. Students will finish by creating their own word problem showing what they have learned about solving word problems and 2-digit subtraction. 1. Student will be able to perform 2-digit subtraction using the standard algorithm. 2. Student will be able to solve sports word problems involving subtraction. 3. Student will write a sports subtraction word problem. Description: This Language Arts course will continue with a heavy emphasis on teaching students to read and giving them time and space to grow. This will include the incorporation of sight words and various reading materials to not only learn about the rules of various sports, but will allow students to see that their comprehension of reading leads to understanding of specifics skills. Since students vary in their reading abilities, students will be offered a reading track that best meets their needs and challenges them to develop in their skills of decoding and comprehension. 1. Students will be able read a story at their appropriate reading level silently for 20 minutes. 2. Students will be able to answer comprehension questions based on their reading. 3. Students will be able to verbally explain the rules of a game after reading the directions on their own (with minimal assistance). Description: In this course, students develop their spatial, logical, and interpersonal intelligences. Activities will include locomotor skills, starting and stopping with control, movement while changing directions, avoiding obstacles, recognition of boundaries, levels and pathways. Students are introduced to basic kicking, punting and dribbling skills. Students will begin to understand how body control and coordination contribute to efficient kicking, punting and soccer dribbling. Students explore body position, balance, making contact with a stationary or moving object and trapping. 2. Kick a moving ball at a specific target. 3. Dribble a ball with control through cones. 4. Punt making contact with laces near a target. Description: Read the Notes is a Language Arts class focusing on how the piano and guitar came to be the instruments we know today. They will continue to learn to differentiate between relevant and irrelevant information when researching. Student will be able to determine what information is relevant and irrelevant to their research. Student will be able to explain how the guitar and piano came about. Student will be able to write information from their research in their own words using legible handwriting. Description: Guitar/Piano is a very basic introductory course to both piano and guitar. Students will spend two days with the guitar and two days with the piano. In order to gain an appreciation for these great inventions, students will have the opportunity to learn a basic cord, notes, and a tune. The will also practice music on various apps and gain appreciation for endurance when it comes to learning a new skill. 1. Students will learn the parts of a guitar. 2. Students will learn the parts of a piano. 4. Students will engaged and play the 7 notes on a piano and a short tune on their iPad. Description: Musical Drawings is a creative arts class with an emphasis in drawing. Students will continue their study of the elements of shape while incorporating a study of musical instruments. This class will help to further develop students observation skills and fine motor skills. 1. Student can explain and draw an example from the each basis element of shape. 2. Student will incorporate the elements of shape into drawings of various sports. 3. Students will incorporate colored pencil techniques into their drawings in order to develop their coloring skills. Description: Students will gain further building experience in this unit by working on wooden xylophones for the classrooms. In this project they will be introduced to safe sawing and explore sanding pieces to achieve proper tone sounds. 1. Students will gain introductory experience with safe hand sawing. 2. Students will understand how to modify a sample design in order to correct identified issues. 3. Students will learn how to sand with a belt or drum sander. Here are some moments from the week! Eden turned 8 years old this week! Blue class was very eager to celebrate her! In Adventure Town, students made giant paper airplanes as one of their activities and tested their design. 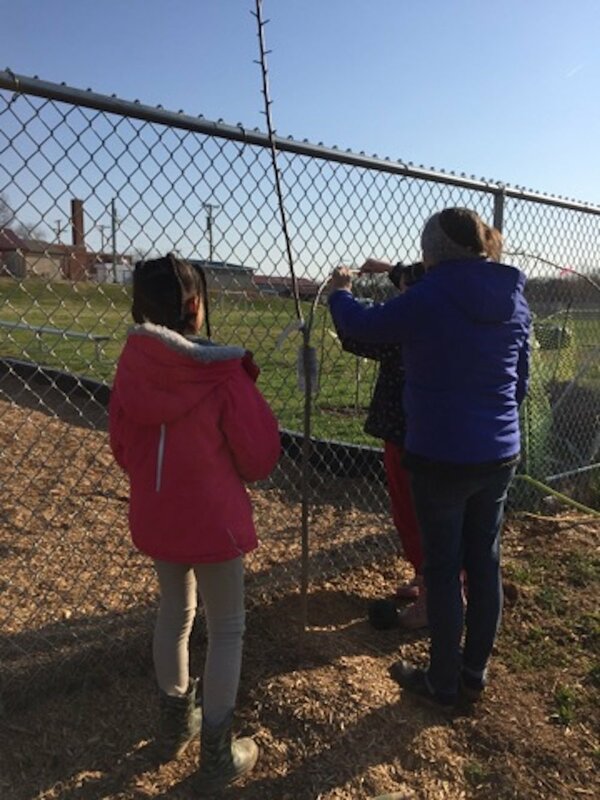 The students had one last fruit tree to plant so Mrs. Bennecker came for Beginnings on Thursday to plant it with the students. While most of the students were preparing the hole and soil for the new tree Nanozi and Noah tied the branches of another fruit tree to the fence. This ensures the tree grows to provide shade for the playground and trains the tree how to grow. Students worked hard to safely use the gardening tools for each of their projects. Rowan really enjoyed distributing the soil to the hole. It was a delight to watch the students plant the fruit tree using all the information and process they have learned in the 3rd quarter. Ajay is proud of his work and ready to see the fruit to come! This week Blue class worked to learn a couple of chords on the guitar as well as learn the parts of a guitar. Students not only used a guitar to learn chords and a short tune, they also utlized their iPad. Students were excited to make books they will use to take notes in this quarter. On Friday, they began to write notes in these books on their research of guitars and pianos. Have a wonderful weekend and coming week!